CDs presented in PDF, Mac and PC compatible. Fully bookmarked and searchable. 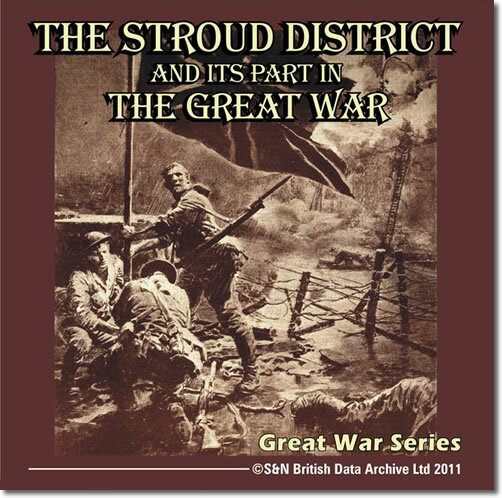 The text on this CD was originally published by The Stroud News, and it examines the role played by the town in the First World War. The disc is divided into two sections: the first tackles the subject chronologically, and the second deals with the individuals involved. The CD is more wide-ranging than might first appear. The wartime careers of inhabitants within 27 other parishes, among them Minchinhampton, Nailsworth and Painswick, are also featured. One proud moment for Stroud was the report in The London Gazette in December 1917, stating that local man Captain Bennett of the Worcester Regiment, had been awarded the Victoria Cross. While significant stories are extensively covered, so too are mundane events, such as Mrs Trinder of George Street for having donated 1,000 eggs to Stroud's Red Cross Hospital since the start of the war.